According to Karen Sprague, Gallia County Administrator, the Ohio Department of Transportation highly prioritized the rehabilitation of the Gallia-Meigs Airport runway, saying that it must be one of the first things upon which the county should consider spending money and maintenance time. 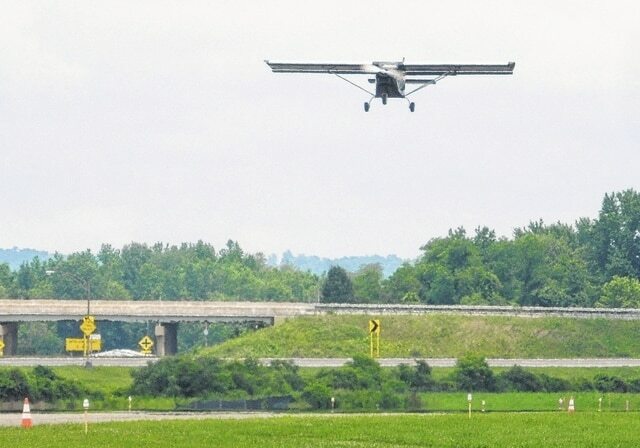 GALLIPOLIS — Gallia-Meigs Regional Airport is expected to receive roughly $1 million in federal funding to restore its runway. U.S. Sen. Sherrod Brown made the announcement late Thursday. According to information provided by Brown’s office, the U.S. Department of Transportation and the Federal Aviation Administration awarded the money. Karen Sprague, Gallia County Adminstrator, was pleasantly surprised as she noted the grant application process can be “a long one.” Sprague said she filed the final grant application June 18. She expected the announcement to be made sometime in August. According to Sprague, the total cost of the runway’s rehabilitation will be $1,202,580. The grant awarded will provide $1,082,322. About $120,250 is expected to come from the county general fund. That is roughly a 10-percent locally funded match, while the federal grant is anticipated to cover roughly 90 percent of the rehabilitation costs. According to information provided earlier in the year by Delta Airport Consultants project manager Steven Potoczak, the project is largely a “mill and fill” effort. Machines will grind asphalt down an inch and then remove debris before new asphalt can be laid. County commissioners said earlier in the year, the last time the airport runway saw any kind of major maintenance was a crack patching project in 2004. The Gallia-Meigs Regional Airport is a commonly used refueling point for pilots. According to Potoczak, the runway will also be grooved once asphalt has been laid over its entirety. A 10-foot depth surrounding the runway perimeter will, however, not be. Grooves are anticipated to be cut a quarter inch deep. Grooves in the runway are meant to displace water and prevent dangerous hydroplaning during aircraft activity on the runway. Sprague anticipates the actual grant award paperwork to be finalized in August with contracting companies soon starting work the same month. The runway will measure 3,999 feet long by 75 feet wide.